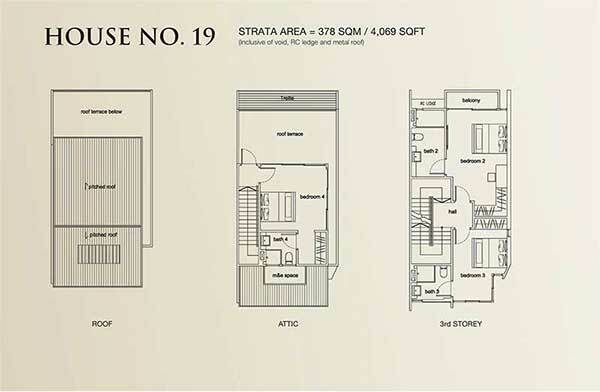 Terra Villas @ Kembangan is an impressive and spacious Freehold Strata Terrace Houses conveniently located at Singapore, District 14 along 23 Jalan Sayang Road. It offers the privacy and tranquillity that you expect from a luxurious community. 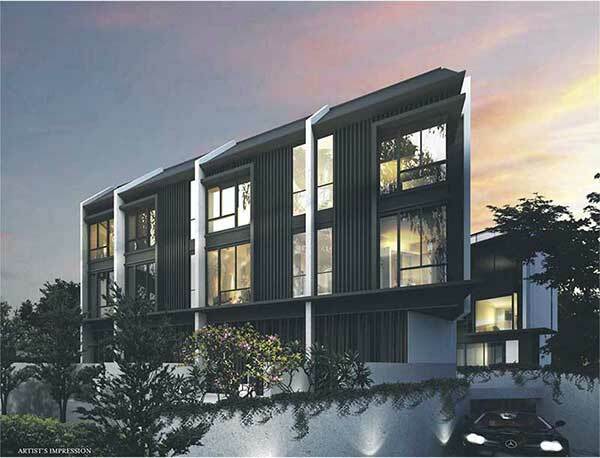 Consists of 2 storey Inter Terraces and a 7 stylish units with communal facilities. Experience classy and unique blend of state-of-the-art design and personal touch. TOP expected to be in 2015. Terra Villas presents an extraordinary value because it was developed by famed developer, TA Corporation and can offer an excellent blend of location, attractive price and psf, amenities, quality, and development features. You and your family will surely love and enjoy your ideal home and lovely community for years to come. Featuring a resort-inspired facilities like pool deck, lap pool, and beautiful landscaped garden that will add beauty to the surroundings and modify green living to its residents. Terra Villas grants you everything you wish for to follow your life’s desire. It features well-equipped areas for interactive, social, and leisure activities that will certainly fulfill the urbane lifestyle of its residents. Given the perfect Terra Villas location, residents may visit all their places of interest include restaurants, famous shopping malls, churches, government institutions, schools, and other leading establishment that all nearby to the property. Shopping malls like Siglap Shopping Centre and Kembangan Plaza are just a stone’s throw away. Go out, relax and unwind to nearest park at Bedok Town Park and also close to leading supermarkets and grocery stores such as Sheng Siong Hypermarket, Shop N Save, Cold Storage, and NTUC Fairprice. Residents can arrive their planned destination easily, either by public or private way of transportation. 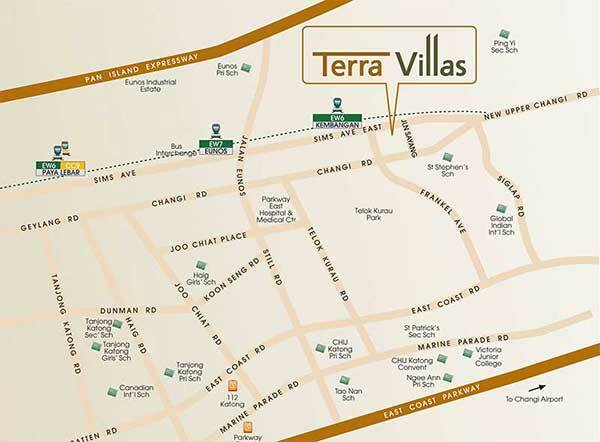 Terra Villas is well-connected to MRT stations such as Bedok MRT, Eunos MRT, and Kembangan MRT. It is nearby to major expressways like Kallang Paya Lebar Expressway (KPE), East Coast Parkway (ECP), and Pan Island Expressway (PIE). Major establishments like Central Business District (CBD), Changi Airport, Suntex and Marina Bay Sands are just a short distance away from the property. Many guardians and parents are searching for a home that nearby reputable and good schools. Well-known schools here include Haig Girls' School, Bedok West Primary School, Ngee Ann Primary School, CHIJ (Katong) Primary, Eunos Primary School, Telok Kurau Primary School, East Coast Primary School, Victoria School, Manjusri Secondary School, St. Patrick's School, Sekolah Indonesia Singapura, Rosemount Kindergarten, etc. With the elements of space and convenience forming a well-balanced life-style, experience an urban haven at Terra Villas! 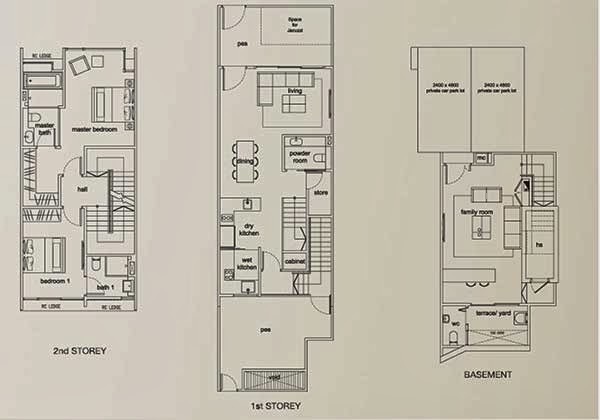 Terra Villas Floor Plans has got 7 different type with unit number from 19, 19A, 21, 21A, 23, 23A and 25. Each unit varies in sizes and layout.